What halachic problems might be involved in using an amplifier on Shabbat? Operating an electrical system, especially in turning the amplifier on or off. In addition, some microphones create electrical currents. Some systems also have signal lights that are turned on and off to indicate the strength and quality of the sound. There are specific Shabbat prohibitions such as mashmiya kol (making a loud noise), avsha milta (public disrespect for Shabbat), and mar'it ayin (giving the appearance of desecrating Shabbat). The sages have forbidden playing a musical instrument, out of fear that there may be a need to fix it on Shabbat. Might this include the use of a loudspeaker? The appearance of a Reform service. The use of an amplifier in a synagogue on Shabbat is one of the identifying characteristics that differentiate between congregations that are Reform, Constructionist, Conservative, or Orthodox. 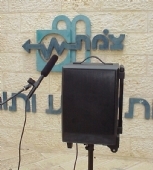 The "Shabbat Microphone" was developed at The Zomet Institute, based on rulings by the late Rabbi Shaul Yisraeli and others who accepted his opinion. How have the problems of using such a system on Shabbat been resolved? The system uses only transistors, without any glowing (or "burning") elements at all. No electric current is ever manually turned on. It is turned on by a Shabbat timer, and once it is on the current flows continuously in the system. The microphone is not "dynamic" (creating a new current when it operates) but is based on the use of a condenser (there is a continuous current which is modified by the sound of speech). This is essentially the same type of microphone as used in hearing aids. All prominent halachic authorities permit the use of hearing aids on Shabbat (including speaking directly into the ear of somebody fitted with such a device). The systems are used for speech only and not for music. According to halachic rulings, an amplifier is not considered a "musical instrument." All the lights and displays are disconnected, as are internal electronic circuits which are modified by the speaker's voice. The system is locked, without any possibility of changing the settings on Shabbat. The on-off switches on the microphones are also disconnected. In case of a disturbance or intolerable noise, the system can be turned off using a gramma (indirect action) switch. It cannot be turned on again, since the only way to reset the system is with a special key held by a person of authority, such as the rabbi. Thus, there is no need to fear that someone will attempt to fix the system on Shabbat. As is true of many modern devices, there is no fear of the appearance of Shabbat desecration, since "everybody knows that the system was set up in advance" (RAMA, Shulchan Aruch Orach Chaim 252:5). Once these systems are in common use, they will be no different from air conditioners or lights that are operated on a timer, which are commonly accepted without fears of mar'it ayin or avsha milta. A sign is prominently displayed stating that the system has been approved by The Zomet Institute, with appropriate explanations and operating instructions. With respect to the "Reform image," we are not involved in such questions. Once the matter becomes commonplace in all synagogues, the image will change. The above points are based on a ruling published by the late Rabbi Shaul Yisraeli, and it was accepted by the late Rabbi Chaim David Halevy and others. The Zomet Institute has installed dozens of loudspeaker systems of this type in <?xml:namespace prefix = "st1" ns = "urn:schemas-microsoft-com:office:smarttags" />Israel and abroad. All the systems abroad have been installed in strictly Orthodox synagogues, with the approval of the local rabbis. In Israel, they have been installed in cultural centers, hotels, and homes for the elderly. Systems have also been used on loan for special occasions, such as a bar mitzva. For more details, see (in Hebrew): Rabbi Yisrael Rozen, Using a Microphone and a Loudspeaker on Shabbat, Techumin, volume15, page 367.